Can you be more specific on what you're referring to as the "load file button"? Also, from where are you downloading/exporting the PDF? 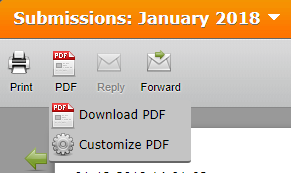 Is it the DOWNLOAD PDF button at the top of the SUBMISSIONS PAGE? Or the PDF button in the middle section of the SUBMISSIONS PAGE? I gave both of these a try and they are both working as intended. Please get back to us with a bit more info and a clearer description of what you're trying to do so we can better assist you. Sharing a screenshot of what you see from your end will also help. Refer to the quick guide below to ensure that your screenshot will reach our Support Forum. It will never post if you attach it via email.